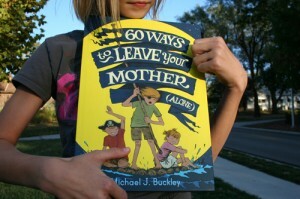 Local cartoonist Michael J. Buckley created the new children's book 60 Ways to Leave Your Mother (Alone). 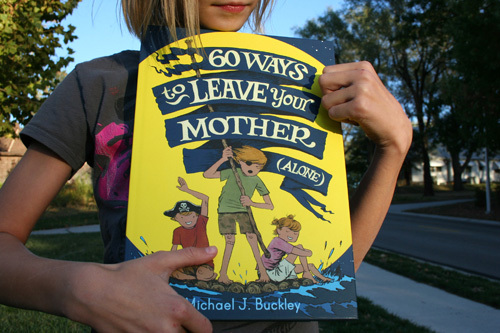 From webcomic to children’s book, Michael J. Buckley has created an ode to childhood with 60 Ways to Leave Your Mother (Alone). The Kansas City-based cartoonist’s new book presents the imaginative adventures of three siblings as they “Make a Toad Happy-Tat”, “ Bee a Bug”, and “Have a Happie Meal”, among other vignettes. Buckley spends his days doing design and web development for Hallmark, and created the book in his spare time. “The most rewarding part for me is that I stuck with it even when the process seemed not worth the effort, or boring, or difficult,” he said. 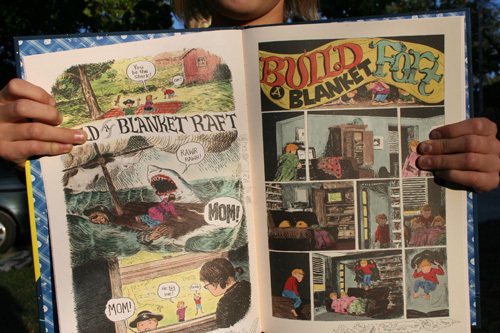 Each story is built from comic strips in a traditional four panel grid, which Buckley originally published online as a webcomic. 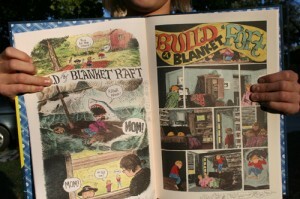 For the book, the cartoonist has assembled the strips four to a page resulting in a series of seamless comic book stories. Since Buckley had the book format in mind when he created the strips, there were only a few tweaks required to avoid the abrupt pacing changes or repetition that some strip collections suffer from. The books are available to purchase from a variety of local booksellers including Reading Reptile, Clint’s, Rainy Day, Poptopia, and the Nelson Atkins Museum store. They can also be ordered online from Buckley’s 60ways.com website. Keep up with Kansas City Comics news. This entry was posted in Local Creators, Webcomics and tagged 60 Ways to Leave Your Mother (Alone), Hallmark, Kickstarter, Michael J. Buckley. Bookmark the permalink.